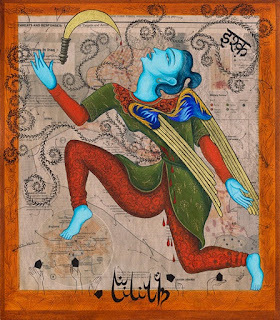 “Ishq: Paintings by Siona Benjamin” combines new and older works by the Montclair, New Jersey based artist, Siona Benjamin. All of the paintings and installations on view deal with the artist’s fundamental concern for tolerance of diversity in our trans-cultural world. Issues of personal identity, gender and race are explored through the artist’s own perspective as a Jewish child who grew up in a Muslim and Hindu community while attending Catholic and Zoroastrian schools in suburban Bombay, now Mumbai, India. Coming from a family of Bene Israel Jews, Benjamin has informed her paintings partly from her study of the Torah. In her earlier paintings in particular, she has used the mythologies of women in the Torah as a way to reflect upon contemporary culture. Her style of painting uses various sources, from Indian and Persian miniatures to American Pop artists like Roy Lichtenstein and Andy Warhol. More recent work exploits various media, combining installation, video, and digital photography. Benjamin attended art school in Bombay before coming to study in the US in 1986 where she received two Masters degrees, one in painting (Illinois University, Carbondale, IL) and the other in theater design (University of Illinois, Urbana-Champaign). She has exhibited throughout the United States, Europe and Asia, and has received fellowships and awards for her art. Her work was recently featured in The Chicago Tribune, The New York Times, the Boston Globe, and Art in America, among many other venues. In 2010, Benjamin was awarded a Fulbright Fellowship and returned to India to do research for a new series of works, some of which can now be seen at Flomenhaft Gallery in New York City.